If you follow me on Twitter, you may know that last weekend my car had a bit of a run in with a large tree. And I didn’t run into the tree, it ran into me! Actually, a very large branch of the tree fell on my windshield, shattering it into a million pieces. It could have been much worse than it was. It didn’t wreck anything but my windshield and turns out that getting your windshield replaced is pretty easy. They come to you and it only takes about 45 minutes and you have a brand new, shiny windshield! Then comes the hard part. If you live in DC, or any city probably, you have to have a number of various stickers on your windshield saying that it passed inspection, and that you can park where you are parking, etc. 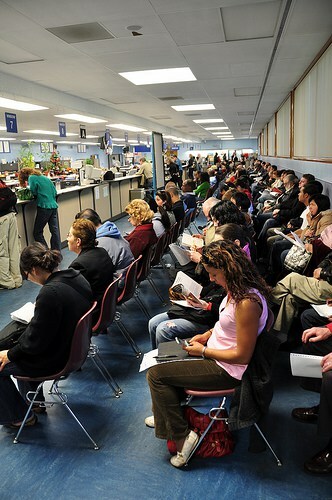 You have to go to the DMV to do all of this. If you asked me to dream up the craziest, most bureaucratic way of managing cars in a city, I guarantee you that it wouldn’t be close to as bad as the DC DMV. Most of all, I feel bad for the people that work there. They spend their days yelling at people and getting yelled at by people. Not. Fun. great links this week! i love the link in the link for http://www.rouxbe.com, best culinary resource i’ve found yet! thanks!